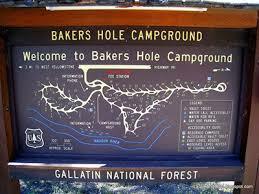 Baker's Hole Campground is located 3 miles northwest of West Yellowstone in the Custer National Forest. Elevation 6,500ft. There are 73 campsites, 33 sites have electricity. Each site has a picnic table and fire ring. No reservations. Fishing nearby. $16/night fee. Extra $7 if electrical hookup. Maximum trailer length 75 feet. Open May 18 through September 15. Maximum stay is 16 days. Yellowstone National Park 3 miles away. 3 mi NW of West Yellowstone on US 191.